For progressive minded and tech savvy individuals, the new wealth and investment firms such as Future Advisor, WealthFront and Personal Capital are appealing choices for how to invest. Some of the discount brokers such as Schwab have reacted to these startups by rolling out new products, such as Schwab Intelligent Portfolios, that provide benefits of robo advisors, with the peace of mind of choosing a company that has been in business for much longer. For those who want to manage their own money, instead of using the robo advisors, startups like Robinhood offer a low-cost way to trade stocks. But I’ve found that self-directed investing has a number of drawbacks, including its complexity, potential for information overload, the lack of accountability for any advice you elect to follow, and the cost of your time. Investing and managing money on your own may not be a great option unless you have an interest in the financial markets or the proper education or training. But having somebody else do it has meant being kept in the dark about what you’re being charged. Fortunately, the new style of firms focused on investing provide some compelling alternatives to the traditional way of investing. Traditional money managers, in my view, suffer from inefficiency (e.g. paper-based systems, inefficient processes), don’t put average investor first (e.g. giving favorable treatment to big institutions) and often rely upon antiquated technology. Beyond this, many big firms have become adept at nickel and diming their clients, making the fees hard to see and finding ways to make money (e.g. stock lending positions in their clients portfolios) that doesn’t benefit the client. The new rules proposed to hold brokers to a higher standard of care are no surprise, given the way the industry has tended to operate. The good news for investors is there’s an innovative and progressive movement coming out of the FinTech industry that’s helping people do the things they need to do to invest successfully. And yet many consumers, investors and even long-established investment professionals are simply not yet aware of the potential for disruption. For those who want to invest through a secure advisor, see it grow for the future at low costs and not have to deal with all the headaches and confusion in between, these new companies offer a solution that streamline processes and sidestep many of the problems of the past. 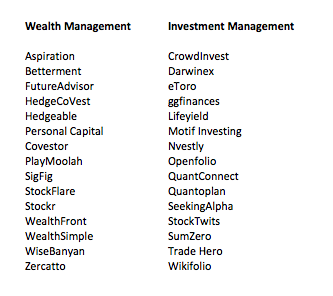 These new digital wealth management companies, including so-called robo advisor firms plus innovators, such as Hedgeable that deliver automated investing with downside protection, are more like tech firms in terms of being lean, data-driven, nimble and looking more to the future and trying to fix the problems with current offerings versus traditional industry practices. I’ve not included all types of firms (e.g. equity crowdfunding, or automated savings/investment firms, like Digits or Acorns), but below is a table of key companies. The software engineers, scientists, intellectuals and finance professionals who are building these firms have invented powerful digital platforms, in my view. The methodologies and investment processes of the new digital wealth management companies work because they are based on proven, successful investing truths; over the long-term you will make money, if you invest early and often, stay diversified and keep the fees to a minimum. Analytical software that effortlessly create personally tailored portfolios and diversified investment plans based on financial needs, goals, time horizon and risk tolerance. Clean user interface that organizes and displays investment data succinctly and intuitively and consolidates investment data in simple, easy to understand formats. Online platforms and processes to make opening accounts fast and easy and helps create efficiency around tax considerations and money transfers when necessary. Smart Phone apps that present organized access to financial data and display market and portfolio statistics with unprecedented clarity 24 hours a day. Interactive knowledge sharing platforms that better educate those who want to learn more. Low fees and incredible transparency around fees which provides clarity as to where clients’ money is going, how it is performing and how much it all costs. These companies offer a range of services to differentiate their offerings: SigFig brings a refreshing and scientific approach to investing via data-centric investment software. Wealthfront will manage your first $10k for at no cost, and provide an industry leading software service for understanding and minimizing taxes. Personal Capital and FutureAdvisor investigate your investments, held elsewhere, and tell you fees you’re being charged by your bank or asset management company that you may not be aware of, given how opaque fee disclosure is in the industry. If you want to make your own decisions, companies will support you with their cutting edge platforms and let you create your own portfolios. Having a lean, highly functional and data packed platform where information is easily collected, organized and presented will only benefit your efforts. Motif Investing offers an intuitive platform where you can design your own portfolio or basket of stocks based on your specific investment ideas, concepts and strategies which you can learn about by clicking through their impressive ‘Discover your Investing DNA’ feature. Even if you’re with a traditional advisor, there are tools to help your advisor boost after-tax returns of your portfolio, since fees and tax-inefficiency hurt total returns. For instance, Boston-based FinTech firm, LifeYield enables advisors to increase returns by up to 33% through tax efficiency. Tax efficiency, through so-called tax loss harvesting, has been around for a while, but many see the technology-led innovation of startups like Betterment pushing traditional providers, like Schwab, to offer this service to more customers. 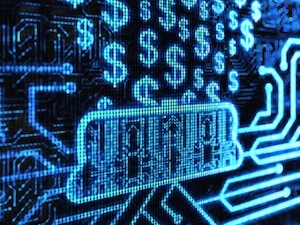 The financial services industry remains ripe for transformation. By recognizing the problems of the past and using technology to correct them, the new style wealth managers offer a greater level of transparency, work more efficiently, and offer low-cost, risk-adjusted, after-tax returns. As this paradigm shift continues, the financial professionals who traditionally had better access to market data and investment ideas are being impacted, despite the fact that the scale of the new providers is still relatively small. Although still small in terms of market share, traditional providers are being shown up for relatively weak user experience (UX), slower processes and higher fees. Most of all, startups are bringing new levels of transparency to fees and costs. Technology has undeniably benefited the consumer in myriad ways, considering its impact on everything from shopping to how we communicate with others. Now it’s past time for the investment world – along with investors – to catch up. Schwab has already responded to the competitive threat. Companies like Fidelity are behind startups like FutureAdvisor and talking to startups like SoFi. The market share of rob advisors is very low, but I believe the future of wealth management is unwritten, and may depend upon the impact of those FinTech startups seeking a better financial future for all of us. This week’s post on the FinTech Blog was written by Alex Hill, who worked in the financial services for more than ten years before leaving to pursue other interests, including the emerging FinTech industry. Alex is based in San Francisco, where he is with a global FinTech organization, NewFinance. Posted on May 7, 2015 May 8, 2015 by Michael Halloran	This entry was posted in Uncategorized and tagged FutureAdvisor, Hedgeable, LifeYield, Motif Investing, Personal Capital, SigFig. Bookmark the permalink.